Marrakesh is surrounded by awe-inspiring natural sights, but heading to the Moroccan countryside takes serious planning. Skip the logistics with this hassle-free, in-depth adventure, which takes you through Saharan dunes, Berber villages, and stunning mountain landscapes. Get off the beaten track while still comfortably in an air-conditioned minivan, with all overnights and most meals included. 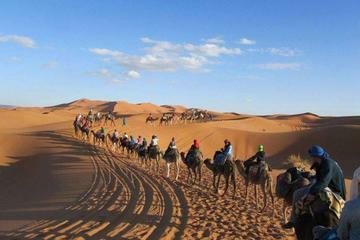 You’ll get an insider’s perspective on Southern Morocco, with a camelback ride and tasty tagine meals. I really had a great time on this safari, it was everything I expected and more. I would definitely recommend it to a friend.